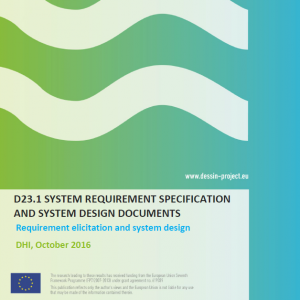 The overall goal of the DESSIN ESS software system is to support users implementing the DESSIN ESS evaluation framework and sustainability assessment, as described in the DESSIN Cookbook (D11.2). This document describes how the software should do this, from the end-user perspective. The document is organized into so-called “user stories”. Each user story describes a task that a user would like the software to perform, and explains why performing the task provides value to the user. The users stories are organized into “epics”, which are groups of similar stories. There are five epics, one for each of the five parts of the DESSIN Cookbook (D11.2). Most of the user stories are written from the perspective of an evaluation lead carrying out an ESS assessment, as this was thought to be the most likely user of the system.